Law enforcement officials intercepted a second suspicious package addressed to California billionaire Tom Steyer Thursday at a mailing facility in Burlingame just south of San Francisco. The latest package was intercepted a week after two similar-looking packages were discovered in California, one addressed to Democratic Sen. Kamala Harris and the other to Steyer, the FBI confirmed. Christie Smith reports. Law enforcement officials intercepted a second suspicious package addressed to California billionaire Tom Steyer Thursday at a mailing facility in Burlingame just south of San Francisco. The latest package was intercepted a week after two similar-looking packages were discovered in California, one addressed to Democratic Sen. Kamala Harris and the other to Steyer, the FBI confirmed. 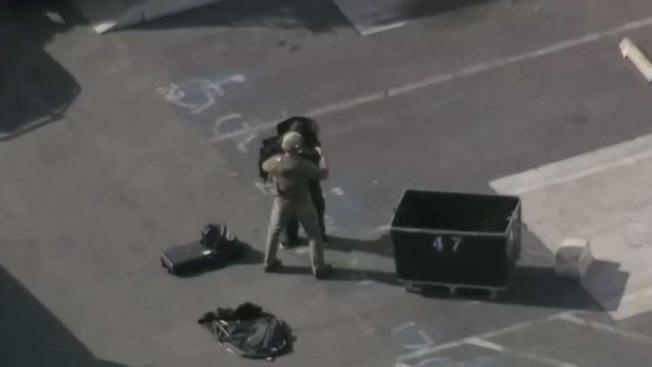 The package found Thursday was rendered safe by FBI bomb technicians. Federal officials said the package was similar in appearance to the package addressed to Steyer that was found last week, but they could not confirm yet that the two were connected. Officials had said the first package sent to Steyer and the one sent to Harris did appear to be linked to the series of packages intercepted last week that were addressed to various prominent Democrats and CNN's New York offices. Fifty-six-year-old Cesar Sayoc of Florida has been charged for the crimes. He is accused of sending at least 15 improvised explosive devices. He was arrested a week ago outside a South Florida auto parts store. The suspect appeared in federal court in Miami on Friday. His lawyers said they would not seek his release on bail for now. Steyer, the California billionaire who has been known for running a high-profile campaign to try to have President Donald Trump impeached, released a statement Friday thanking the law enforcement officials who discovered and intercepted the latest threatening and potentially explosive package, which he said is "a part of a larger assault." "These threats are not isolated but are a part of a larger assault on the norms that uphold our democracy," Steyer said in his statement. "We will not relent as we push for the broadest possible democracy and a life of dignity and respect for every American. "We are more motivated than ever this Election Day to secure victories for representatives who will uphold the values of democracy rather than assault them for political convenience," the statement read. Law enforcement agencies in California descended on the state capital Sacramento and the city of Burlingame just south of San Francisco last Friday to investigate the packages addressed to Steyer and Harris, neither of which detonated or caused any injury. Gonzo Rojas contributed to this article.